Personal Details: Bill was the son of William Francis Stuart and of Alice Stuart (nee Pretty), of Morrinsville. He was educated at Tauwhare and Motumaoho primary schools, and Hamilton Technical College. He was a keen sportsman, playing football, cricket and tennis, and also had an interest in riding horses. Service Details: Bill applied for the RNZAF in December 1939, but due to medical reasons he was not immediately accepted. He eventually enlisted on the 13th of April 1941 at the Initial Training Wing, RNZAF Levin. "Leading-Aircraftsman J.W. Stuart was the guest of honour at a morning tea gathering organised by the Cambridge District Patriotic Committee yesterday. He was presented with a wallet bearing his initials. Before joining the Air Force, Leading-Aircraftsman Stuart was farming for three and a half years with his brother, Mr R.K. Stuart, at Roto-o-rangi. His home town is Morrinsville, where his mother and father, Mr and Mrs W. Stuart, reside. While expressing confidence in the final result of the war, the Mayor, Mr Edgar James, made reference to the seriousness of the situation, a fuller realisation of which had been brought home to the people of New Zealand by the action in Greece and Crete. In giving protection to the Army and Navy, the Royal Air Force was very necessary for victory, added Mr James. Every airman who joined up was bringing closer the time when England would have supremacy in the air. It would be then that we would take the offensive and fight of for victory. "With all his territorial gains, Hitler will be beaten," said the Mayor. "He will be desperate at the finish, as he has made no impression on the morale of the people." Mr James impressed to Aircraftsman Stuart the district's appreciation of the part he was going to play in bringing victory closer. Mr R. Newcombe added best wishes, on behalf of the Returned Soldiers' Association. He said that ex-servicemen considered that this war was a continuation of the last, and they were out to help the present-day soldiers in every way possible. The wallet was presented by the Mayoress, Mrs James, to Aircraftsman Stuart, who returned thanks for the reception and the gift. He said he was keen to go away, but was sorry to leave good friends behind. An apology was received from Leading-Aircraftsman R.L. Caley, who had been invited to share the honours of the gathering with Leading-Aircraftsman Stuart. 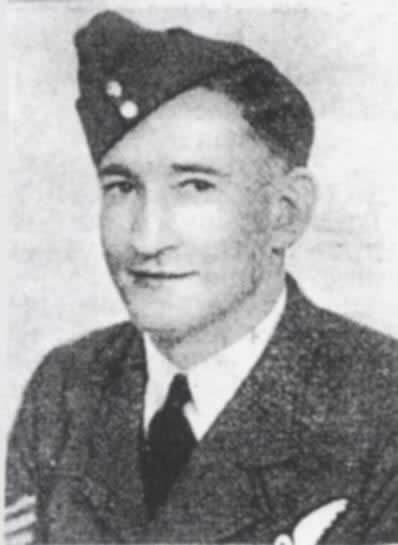 Leading-Aircraftsman Caley was born at Pukerimu, being the son of the late Mr and Mrs R. Caley. Since leaving school, he had been sheep-farming at gisborne and Hawke's Bay. " I believe that Bill Stuart left New Zealand for Canada on the SS Awatea on the 18th of June 1941. Upon arrival Bill was sent to No. 6 Air Observers School in Prince Albert, Saskatchewan, on the same course as LAC R.L.Caley. There, Bill underwent training as an air observer, or navigator, in Avro Ansons. On the 28th of September 1941, Bill proceeded to the next level of his course, with No. 3 Bombing and Gunnery School, at MacDonald, Manitoba. he completed this course on the 8th of November 1941, at which point he received his Air Observer brevet, and was promoted to Sergeant. The following day Bill was posted to No. 1 Advanced Navigation School at Rivers, Manitoba. This course took him through to January 1942, at which point he crossed the Atlantic to England. On arrival in Britain, Bill reported to No. 3 Personnel Reception Centre in Bournemouth, where he was to spend several months awaiting his next course. He was promoted to Flight Sergeant on the 1st of April 1942, and on the 7th of that month Bill finally got his posting, to No. 9 Air Observer's School at Penrhos, Caenarvonshire, in North Wales. At the school he trained on Bristol Blenheim light bombers, until he completed this training and was posted in May 1942 to No. 11 Operational Training Unit at Bassingbourn, Hertfordshire, to convert onto Vickers Wellington bombers. In early June he moved with the OTU to a satellite airfield at Steeple Morden. He began to take part in operational exercises, flying as the bomb aimer on the majority of flights. On the 31st of July 1942, Bill took part in his first operational raid, when he was involved in bombing factory buildings in Dusseldorf, Germany. On the 11th of August 1942 Bill was posted to No. 156 Squadron at Wyton, Huntingdonshire, and shortly afterwards moved to a nearby satellite field at Warboys. With this squadron he began carrying out exercises and operations. Details of Death: At 20:39hrs on Thursday the 27th of August 1942, Bill was on the crew of a No. 156 Squadron Vickers Wellington III (coded Z1613) that took off from RAF Warboys, Huntingdonshire to make a raid on Kassel, Germany. A Pathfinder squadron,,Bill's plane was one of 306 aircraft taking part in the raid, 33 of which were to be lost. Buried At: All six crew members are buried at Eindhoven. Connection with Cambridge: Bill Stuart lived and worked in the Cambridge district before the war. Sources: Details of this airman's death were sourced from the excellent volumes of 'For Your Tomorrow' by Errol Martyn.